Thanks for stopping by! Here is another digi in the progressive challenge I am participating in. Designed 2 Delight. Digi's are so much fun! While preparing this card I just kept saying to myself it seems like yesterday when all the snow melted and I was able to see the ground. I say the winter season comes too soon and lasts too long. Sorry I have been MIA I had company visiting from out of town. BRRR! So super fun! Great image! Your coloring on the snowman is super. I missed you. I love the blue shading on the snowman. How awesome. I would never have thought of that. Thanks for sharing. Cute card and isnt' that digi just the best. Very gorgeous! I love the ornament as the background! Great idea! Love the blue ornament background and your snowman is darling!!! Aww gorgeous! I love the way you colored the snowman! Thanks for playing with us @ D2D! Looking good. I sure do like that the image is centered on the ornament. Great job! Adorable card! I love the shape & embossing! wow, beautiful sums it up! This is so cute! Adorable! Girlia, love the card and all the shine and bling!!! You did great, and it so cute!!! Very pretty card Girlia! Gorgeous coloring and love all that glitter. I like the ornament mat too! 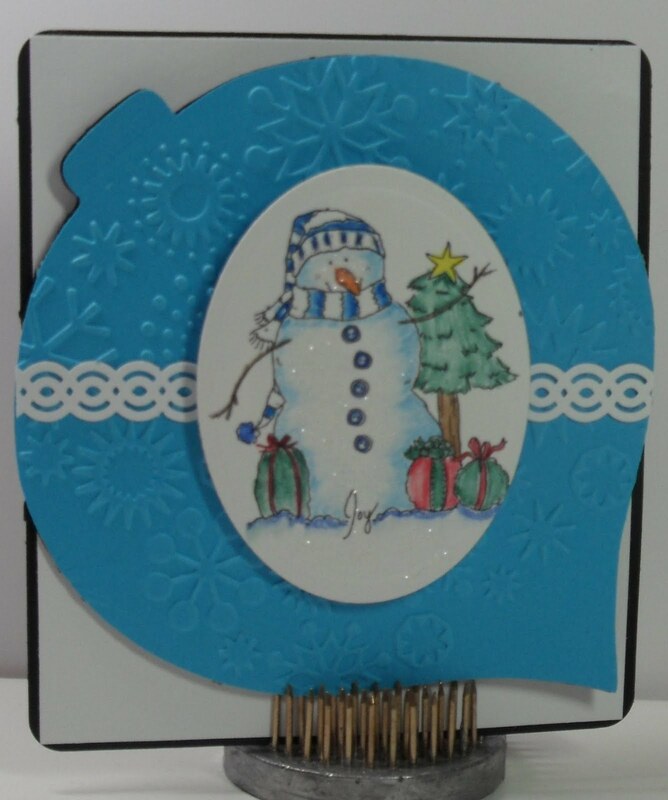 Thanks so much for using Christmas Snowman by Designed2Delight and entering our challenge. We enjoy seeing your work! Just gorgeous!! The snowman is super cute and the embossing is great! Nice job! Love this card! Love the snowman! I am a new follower! Wow, this is gorgeous. Love the big turquoise ornament, so cool. Thanks for joining us at D2D this week. I love this card. The color is awesome.